1.Durability and Long Term Support: One of the key differences between a tablet from a big-box store and the tablets designed for use in the field is the amount of wear and tear they can be expected to withstand. A standard tablet used on a construction site or in a warehouse will undoubtedly encounter countless hazards that could compromise the performance of the device: Dust, debris, moisture, drops to rough surfaces, and temperature variation, to name a few. Making the investment in a tablet that is designed for the conditions in which it will be used saves time and money. It also ensures operations won’t stall due to devise failure. A rugged tablet like Winmate's M9020, for instance, is custom-designed for rugged industries, built to withstand 6-foot drops to a concrete floor, and sealed to IP65 to protect against spills. That kind of reliability just doesn’t exist for consumer models. 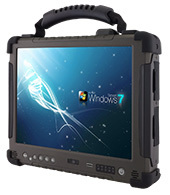 2.Variation of Functionality: Today, many rugged tablets come enterprise ready, equipped with full Windows operating systems, and applications tailored to meet the demands of specific industries. Across enterprise, rapid processing, reliable communications, and robust system memory are essential. Winmate’s ultra-rugged tablets are built to ensure you never miss a beat even in the most extreme temperatures or environmental conditions. 3.Rugged Design: Consumer tablets offer few options for customization. In industrial applications however, flexibility is a must when it comes to peripherals, I/O ports, and mounting options. Products like Winmate’s M101 series offer custom-designed vehicle docks with quick-release functionality, multiple I/O ports including serial, micro USB, micro SD, audio, and standard USB, along with integrated 1D/2D barcode scanners and optional RFID readers. 4.Total Cost of Ownership: The sticker price of a consumer tablet may initially seem lower than the price of a rugged tablet, but when comparing tablets, consider the true cost, or total cost of ownership (TCO). When a device fails, mobile workers lose 50 to 80 minutes of productivity on average. This is significant when you take into account that productivity loss represents roughly 40% of a tablet's TCO. When a tablet is not built for industrial environments, the risk for damage also increases, and thus so does the cost over the long term. In fact, TCO decline as the ruggedness factor of a tablet increases. According to research by Venture Development Corporation, the TCO for rugged mobile devices over 3-5 years, is 15 percent lower than a non-rugged device.